Dune systems of the Commonwealth of Virginia are a unique and valuable natural resource. The primary dune and beach of existing shore systems are protected under the Coastal Primary Sand Dunes and Beaches Protection Act (the Act). Until 1998, the exact extent of existing dune systems in the Chesapeake Bay was largely unknown. In addition, the relationship between primary and secondary dunes had not been explored. determine the relationship between primary and secondary dunes. Dunes act as a reservoir of sand which can buffer inland areas from the effects of storm waves and, in the process, act as natural levees against coastal flooding. During high energy conditions, such as the northeast storms which frequent the Eastern Seaboard, primary dunes may be subject to attack by wind-driven waves aided by storm surges. The dune may be eroded, and the sand deposited in an offshore bar. Then, under low-energy conditions, the sand may move back to the beach. All dunes in the Chesapeake Bay estuarine system are mobile features especially with regards to coastal zone management. Unlike ocean dune fields that are relatively continuous features exposed to the open ocean, the dunes of the Chesapeake form across a temporal and spatial geomorphic matrix driven by sand volume, varying wave climate, and shoreline geology. The coastal geology, in large part, determines whether shoreline erosion acts upon the upland (high bank) or marsh (low bank). Sand supply and the long-term local wave climate are significant factors in the location of dunes. The stability or ability of a dune/beach system to accrete over time is necessary for the formation of secondary dunes. Natural dunes in the Chesapeake Bay estuarine system vary in size and nature, but all require an accreted feature, such as a beach washover or a spit to become vegetated above the intertidal zone. 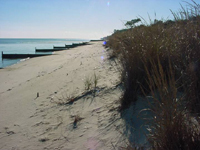 Vegetation and a continuous beach/dune profile are required to create the jurisdictional primary dune. When the dune/beach forms across a low marsh shoreline, the system may move landward in response to storms, and only a low primary dune will exist. If sand can accrete bayward due to shoals, spits, or man-made features such as jetties and groins, then a secondary dune may develop from the original primary dune.